“Americans delay retirement as housing, stocks swoon” was the headline of a recent story in the Wall Street Journal (WSJ). As a description of what's going on, it should be taken with a rock of salt. According to the front-page article, “millions of retirement-age Americans, stung by the recent economic pall, suddenly are having to reassess their plans —with many forced to quickly change course,” (emphasis mine). The Journal itself provides evidence to the contrary. They print a chart (left) that shows that the proportion of people ages 55 to 64 in the work force has been increasing since at least 1990. Seniors have been postponing retirement for 17 years now! And recent numbers do not indicate a switch of gears, but a continuation of a long-run tendency. It is still possible that the thick-lined graph can’t capture recent changes adequately. Or maybe what the writer meant is that the time series is above its trend. After all, the labor force participation (LFP) of people in that age group did increase steadily between August 2007 and February 2008. To examine this possibility, I calculate the trend (for the nerds: I use the Hodrick-Prescott filter). Chart 1 below shows the trend along with the raw time series. If my calculations are correct, observed LFP in February was indeed about 0.5 percentage points too high. The writer tells us that the LFP in February was up 1.5 percentage points from last April. But that month the participation rate was 0.6 percentage points below trend. In other words, she is comparing a point that is well below expected values with one that is well above, leading to an overstatement of the facts. She goes on to say that the surge in participation “translates to more than an additional million people in the job pool” since April 2007. After a few simple calculations I find that an accurate statement would be: “In April 2007 there were 197,000 fewer seniors than expected in the labor force, whereas in February 2008 there were 172,000 more than expected. Population aging plus the growth of trend LFP mean that between April and February we should have expected an increase of 659,000. But because of deviations from the trend on both ends, the actual increase was 829,000.” But that won’t draw many eyeballs. Another reason to downplay the recent numbers is that blips like this are frequent and short-lived (see Chart 1). The central point of the WSJ article, however, is that some seniors have been putting off retirement because “falling real-estate and stock markets are erode their savings.” Historically, falling asset prices are not strongly correlated to the LFP of people on the verge of retirement. In 1990-92 home prices fell and stocks barely grew, but participation did not go up. Falling asset prices is thus not a sufficient condition. Or perhaps, as the WSJ insinuates, it takes a double whammy to throw older workers off the retirement track. Falling markets is not a necessary condition either. 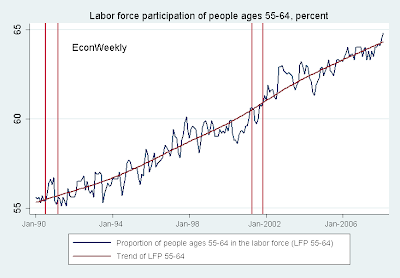 Since 1990, the LFP of people ages 55 to 64 has risen in three bursts: 1995-98, 2002-2003, and 2005-2007 (see charts above). Now, 1995-98 and 2000-2003 were periods of rising home prices. And a bull stock market dominated 1995-98. I guess that back then journalists would have written that folks were waiting for the markets to peak before retiring. You gotta explain things somehow. Of course, all the historical data in the world cannot refute that this time falling asset prices may be postponing retirement. As I showed above, though, the change in LFP so far is quite small. And now that I’m here: the business cycle cannot explain the LFP of senior workers either. For most demographic groups participation in the workforce is pro-cyclical. It should fall —at least below trend— in periods of high unemployment and low wages. Retiree wannabes do not conform to the pattern. Their LFP rose above trend during the 1990-91 recession, as well as during the weak labor market of 2002-2003 (see Chart 1). That LFP has a mind of its own, I tell you.